The State of New Jersey Riparian Map of Cumberland County, 1876 (Sec. 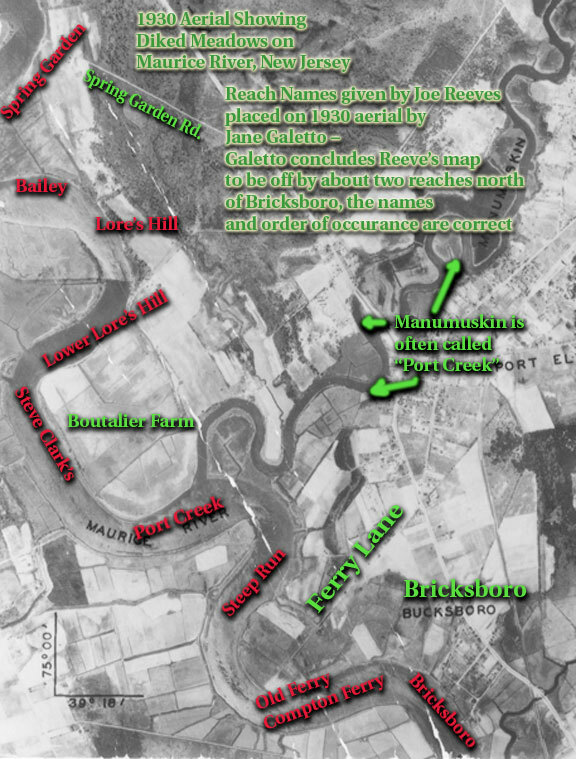 No 3) shows that Stephen Clark owned property on the western shore (Located opposite and midway between the town of Bricksboro and the mouth of the Manumuskin.) It shows Stephen Clark's name also associated with a property further north across from the Lore property as well. In Fola Bevan's article, History of Buchshutem, Bevan gave a synopsis of some of the early settlers of Commercial Township. The families who lived on the once wooded property between the Bevan Wildlife Management Area and Reeves Lane (on the east side of the road) included the Stephen Clark family. This is in the vicinity of Steep Run Road. One of the early settlers was Franklin Elmer, who eventually moved to Fairton. Bevan wrote, "He lived directly on the river. " Mary E. 53 - born in Pa.
Austin 10 son at school - NJ. There is no indication about where the Clark homestead was in Bevan's article, but the notations on various maps puts the Clark family on the western shores of the Maurice River at this reach. There is a map of Cumberland County that shows the location of the families listed in Bevan's article. The 1862 map, which hangs in the Lummis Library in Greenwich, NJ, is based on the surveys of S.N. and F.W. Beers. The map shows a small run on the western shores of the Maurice, midway between where the Manumuskin and the Muskee empty into the Maurice on the eastern shores. 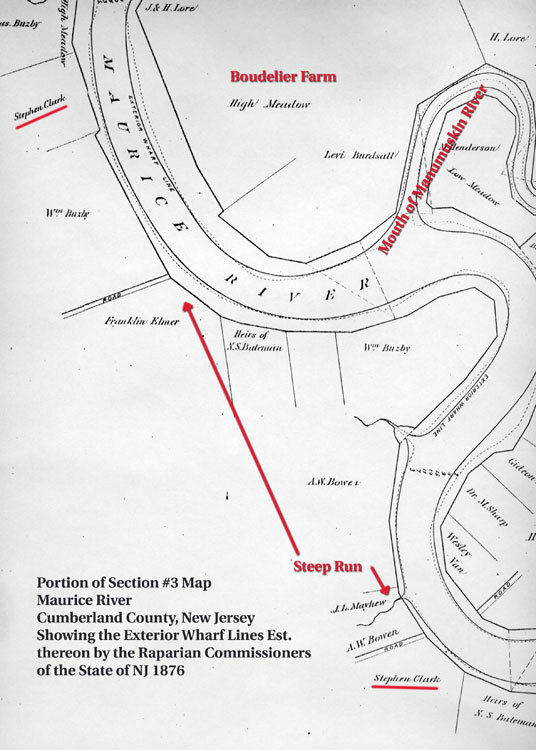 Just south of this run, called Smith's Run, are notations of the property owners mentioned by Bevan, including S. Clark. In his book Maurice River Memories, Joseph Reeves, Jr described one fishing trip in 1943. He wrote that as he and his dad, Joseph Reeves, Sr., came around the reach they knew as Steve Clark's, the fish were jumping. Reeves added that his dad told him that the fish were herring, a tasty meal for the "fish hawk" (osprey) that swooped down in front of them. 6/06 Editor's note the Historical Atlas of Cumberland Co. New Jersey D.J. Sewart 1876 shows the S. Clark property to be north of Steep Run on the west bank of the river. It show the property to be north of the confluence of the Manumuskin River (but again on the west bank). So one could assume this reach is considered to be starting around the Boudelier Farm and ending around Steep Run.